I gotta say I'm really loving these horror movies that take place during a conventionally un-frightening holiday, Black Christmas, April Fools Day... is there an Easter horror movie? Chanukah? St. Patrick's Day? -Wait is that Leprechaun...damn! Oh well I just get a real gas out of them is all. To be honest, Valentines day is really one of the better un-scary holidays that you could make into a horror movie. All those heart and arrow images it's just asking to be turned into a violent bloody love fest. Now I meant what I said about Valentine Bluffs being one happenin' town. 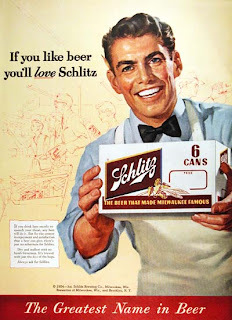 In this town there is no one younger than 20 and instead of going to college you work in the mines all day and then go to a bar and drink Schlitz all night! Woohoo. Oh also fat ugly guys have attractive girlfriends, and there's only one real cop- plus they have a sick laundry mat. The legend goes that 20 years ago there was a horrible mining accident leaving all the workers who were down there at the time dead. The rest of the workers were busy getting their freak on at the annual big Valentine's Day dance. The sole survivor, Harry Warden was found eating someone's foot and after that began killing people on Valentines day vowing that he would never let anyone celebrate Valentine's Day again. Now in the present day the town tries to throw the first Valentine's day dance in 20 years- the only problem is Mr. Party Pooper Harry Warden seems to be back and angrier than ever. This movie is first of all extremely hilarious. I'm not sure if it's intentional but it is at times so dramatic and cheesy that it makes me really happy. It reminds me of a tamer Porky's where all the guys actually get laid- for some reason, and they are all miners who only drink Schlitz. The girls are pretty pathetic and their only sole purpose in life seems to be to decorate for the Valentine's Day dance. Which makes me wonder what they've been doing for the past 20 years. Besides being wildly entertaining, the movie had some impressive kills. My favorites were when the old lady was killed and then put into the dryer- where it took the cop an excruciating 5 minutes to find the only dryer with blood oozing all over the glass. And my second favorite- but maybe winner for best death was that shot of the dead girl's body with the water from the shower coming out of her mouth- and showing just the slightest touch of red in the water...genius! It looked so surreal and sublimely gorey- yet we only got to see the fuzzy side profile of her face- BUT it was still extremely affective. As for the identity of the killer? Well let's say I kind of figured it out a bit early- but his drastic change in character was amazing and his final laugh before the credits really got me in my funny bone. You won't find a necessarily cinematic horror masterpiece with this one, but it's a very delightful hour and 30 minutes filled with laughs, blood and really really creative deaths that I found to be unexpected and strangely refreshing. I'll check out the remake next- but if they don't drink Schlitz in it- I'm out. 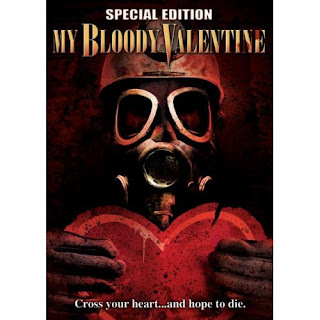 Buy My Bloody Valentine at Horror Movie Empire! This post was brought to you by our sponsor. Loving the blog! Hope you're having a great Halloween so far.